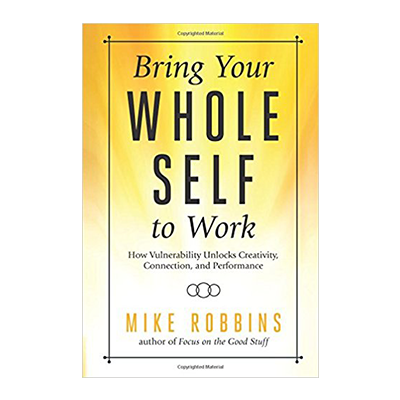 There are some simple principles that everyone should know when it comes to “Bringing Your Whole Self to Work.” In my interview with author Mike Robbins about his new book entitled “Bring Your Whole Self to Work” we discuss the elements of authenticity and vulnerability and how knowing the importance of being vulnerable and humble can go a long way when it comes to job performance and engagement. As Mike states self-righteousness separates us from others and negatively impacts our work environment. One of the things that makes authenticity challenging is the way we cling to our self-righteousness and avoid vulnerability, that we worry about damaging our credibility. We erroneously think that somehow being right and covering up any perceived weakness, flaw or insecurity will give us credibility with others. Authenticity is the foundation of bringing our whole selves to work. When we have the courage to be authentic, not only does it liberate us, but it also gives us the ability to inspire and empower others. If you want to learn more about the five (5) simple principles, then listen to my interview with Mike Robbins the author of ” Bring Your Whole Self to Work“. Mike is also the author of several other books, and to learn more about his previous works, please click here to be directed to his website. I hope you enjoy my interview with author Mike Robbins.